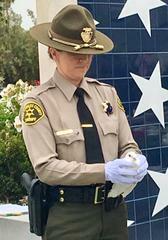 Today's Peace Officers' Memorial Ceremony was a beautiful expression of remembrance for LA County's Fallen Heroes. 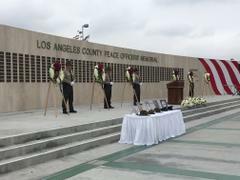 For the second consecutive time since the restoration of the Eugene W. Biscailuz Regional Training Center, the 49th Annual Los Angeles County Peace Officers’ Memorial Ceremony was held on the facility grinder. The “grinder” is where young men and women striving to become peace officers of the future are trained and tested. It is where they will forever be reminded of the sacrifices of those from the past. A colorful, freshly-styled Memorial Wall stands erect as the focus of the outdoor venue; it exhibits the names of the 520 peace officers who lost their lives in the line of duty while serving the residents of Los Angeles County. The annual Los Angeles County Peace Officers’ Memorial Ceremony commemorates the lives of these peace officers and recognizes their ultimate sacrifice. 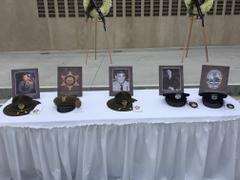 This year, we paid special tribute to honor five of these fallen heroes and their names were added to the Memorial Wall. In addition to commemorating and recognizing the lives of these peace officers for their ultimate sacrifice, the Peace Officers’ Memorial Wall will be dedicated this year to those peace officers’ names who are on the wall. The path of dedication of this wall is over 50 years in the making. 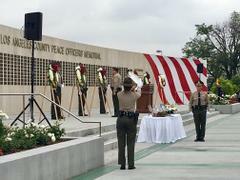 The first Los Angeles County Peace Officers’ Memorial Wall was dedicated in May 15, 1970 at Biscailuz Center Training Academy by Sheriff Peter J. Pitchess. When the wall was first erected, there were 253 names of men enshrined and no women’s’ names. In May 14, 1984, the Sheriff’s Academy moved from East Los Angeles to Whittier and the Sheriff’s Memorial followed. In the same year it was moved, Sheriff Sherman Block dedicated the second Peace Officers’ Memorial. 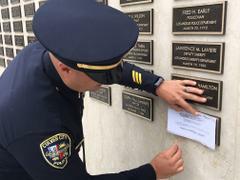 For the next 30 years, Whittier was the site of the Peace Officers’ Memorial Ceremony. 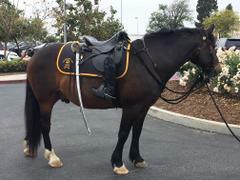 When the Sheriff’s Academy left Whittier and returned to its original home at Biscailuz Center, in 2014, it was decided that the memorial should return as well. Unlike the memorial in Whittier, which faced the main courtyard of the STAR Center, this memorial overlooks the “grinder”. This wall is a powerful testimony to the gravity of the profession. The peace and freedom of the people of Los Angeles County comes at a cost, and for some that cost was the full measure of their devotion. On today’s date, May 23, 2018, the newly freshly-styled Peace Officers’ Memorial Wall was dedicated by Sheriff Jim McDonnell. The wall now displays the names of 520 men and women, including the five honored today. Since the wall was initially raised, the names of 10 women have been appended. 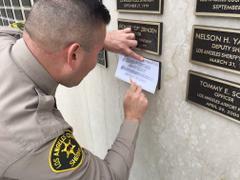 The Los Angeles County Peace Officers’ Memorial Wall serves as a constant reminder that we owe them for their noble sacrifice, a debt that cannot be fully paid. This wall is not just a place where we recognize the fallen, but where we also recognize and remember those they left behind. This wall is as much in honor of our heroes, as it is for their loved ones. They also have given the full measure of their devotion and remind us of the sacrifice of the ones who meant so much to them.